Frenkie de Jong doesn’t appear afraid of Real Madrid one bit as the Ajax midfielder prepared for the visit of the Spanish giants in training on Tuesday. 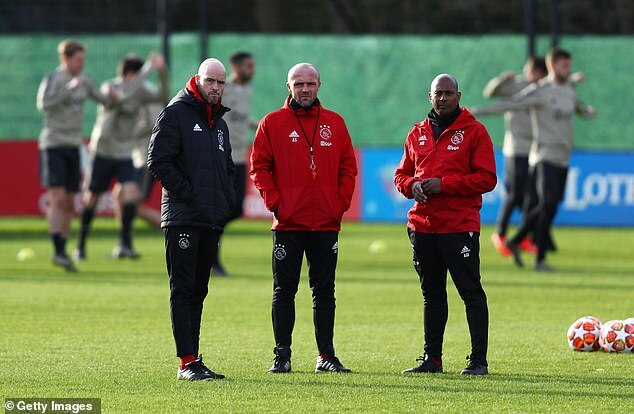 De Jong was pictured pointing and laughing with the rest of his team-mates as Ajax put together the final touches to their plans for the last-16 Champions League tie. The 21-year-old, who will join Barcelona on a five-year deal in the summer, was an injury doubt as recent as Monday. Ajax will be reliant on De Jong to provide a creative spark when Santiago Solari’s side visit the Amsterdam Arena. Real head to Holland in good form after beating rivals Atletico Madrid 3-1 in La Liga on Saturday. Ajax are six points behind league-leaders PSV Eindhoven after suffering a 1-0 defeat at Hercales on Friday. Erik ten Hag’s side have only won one of their four league games in 2019. Striker Klass-Jan Huntelaar has scored 10 goals in 22 appearances this season. Huntelaar played for Real for eight months in 2009 before moving to Milan. He wants Ajax to replicate their form from earlier in the season, when finished second in their Champions League group on 12 points behind Bayern Munich. ‘If we play like we played earlier this season in the Champions League, we can make it very difficult for Real Madrid,’ he said. ‘But, at first hand, they are the favourites. We will only be satisfied if we qualify for the next round.